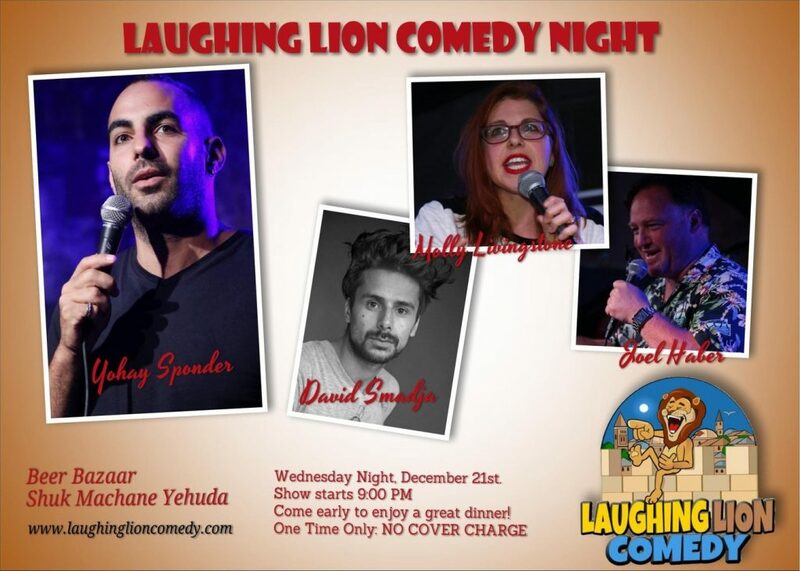 Join us for our next Laughing Lion Comedy Night, Wednesday December 21st, at the Beer Bazaar in Machane Yehuda Market! The Beer Bazaar has a beautiful new courtyard through the back of the bar, and we are so happy to be putting on what we believe to be the first ever stand-up comedy show in the Shuk! And to celebrate that, plus the end of our first year of English-language comedy shows in Jerusalem, we are, for this show only, bringing you some of your favorite comics from the past year, with NO COVER CHARGE! Show starts at 9:00 PM. Come early to enjoy great kosher food and a selection of over 100 of the best Israeli craft beers! Table reservations are recommended. You may reserve seats via the “Find Tickets” link on the Facebook invite.